The Triton 100% Plus Team Tour will open on Lake Guntersville February 11, 2018. Launching out of Goosepond located at 417 Ed Hembree Dr. Scottsboro, AL 35769, anglers will be competing for the chance to take home a Triton/Mercury Package that is valued at $20k. Last year, the team of Josh Butler and Jeb Tate took home the boat with a winning weight of 24.31 pounds. 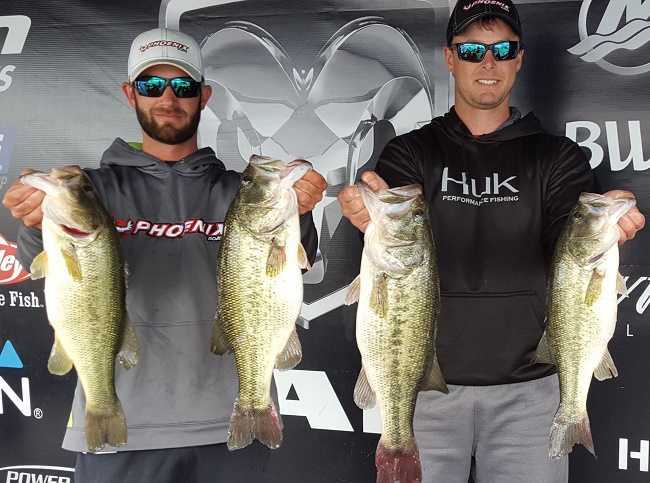 Fishing conditions has improved on Guntersville helping to shape this event to have big weights for the first event of the year. Goosepond offers anglers a prime location for blast of and weigh in. Jamie Shay at The Bait, Tackle, and Grill at Goosepond provides anglers with a warm breakfast as well as a wide variety of fishing tackle to get them through the events. Anglers may begin fishing at safe light with weigh-in beginning at 3:00 p.m. CST on Sunday. Registration begins at 4:00 p.m. CST at the tournament trailer located at Goosepond. The entry fee for this event is $250 per team. This event offers a High Stakes Option Pot of $100 per team as well as a Big Bass Option Pot of $10 per team. In addition to cash and prizes for top finishers, teams fishing the Triton 100% Plus Team Tour throughout the season may also win contingency bonuses from our sponsors Triton Boats, Mercury Outboards, MotorGuide, T-H Marine, ABU Garcia, Garmin, and Power Pole. See the manufacturer web sites for specific details on how to qualify for these bonuses. ABA is sponsored by: Triton Boats, Mercury Marine, Motorguide, Garmin, Sirius XM Marine Best Western Hotels, Livingston Lures, Power-Pole, T-H Marine, Hydrowave, Maui Jim, Abu Garcia, Berkley, and Geico.